Apple is a company that’s known for dominating nearly any industry it touches. Now, it seems as though the company may be getting into a new industry, virtual reality gaming. The industry, currently dominated by Facebook and Microsoft, is expected to be the next big thing in gaming. 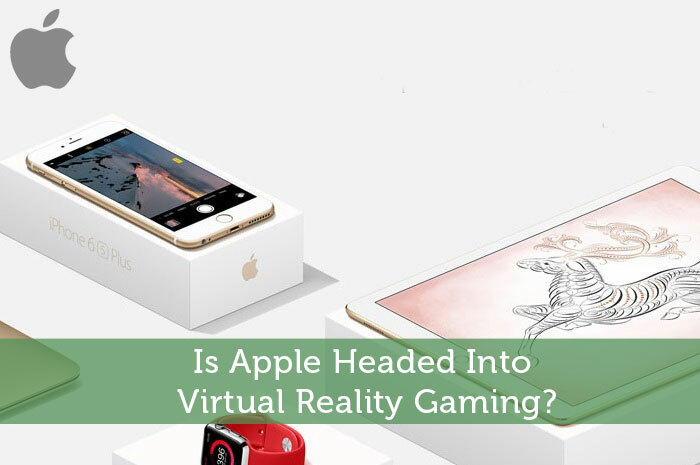 However, if Apple does make the decision to get into the virtual reality gaming industry, Facebook and Microsoft may have something to worry about. Today, we’ll talk about the clues that Apple is considering stepping into the space, whether or not they do have the ability to dominate the industry and how this could affect Apple’s stock price. The clues that Apple may be getting into the industry of virtual reality gaming aren’t anything new. In fact, they started about two years ago when the company acquired PrimeSense. PrimeSense is an incredibly innovative company that introduced the first in a line of 3 dimensional body sensing technology. Since the introduction of this technology, we’ve seen it most prominently used by Microsoft in Xbox. In fact, the 3D body sensing technology is the leading driver behind the Xbox motion sensing device known as Kinect. The devise helps to add a virtual reality dimension to Microsoft gaming consoles. When the acquisition of PrimeSense happened, the questions with regard to whether or not Apple plans on stepping into the virtual reality industry started to pop up. While we haven’t seen anything by way of virtual reality from Apple since their acquisition of PrimeSense, questions are being raised about their plans in the industry yet again, following the company’s most recent acquisition. On November 24th, it was announced that Apple has acquired a company known as Faceshift. Faceshift is a company that was founded in Switzerland that is heavily engaged in the virtual reality industry. The company created technology that senses the facial expressions of those using virtual reality systems. The company’s technology uses the information it captures with regard to facial expressions and uses them in animations. This technology made its big break when it was used in Disney‘s Star Wars franchise for Star Wars: Episode VII – The Force Awakens. So, Is Apple Getting Into The Virtual Reality Gaming Industry? Apple is a company that’s known for being relatively secretive when it comes to their plans for future technology. So, as we would expect, the company has made no comment with regard to whether or not they plan to move into the virtual reality gaming industry. Nonetheless, at this point, I don’t think Apple needs to announce their plans as they are relatively clear. The reality is that it simply wouldn’t make sense that Apple would acquire two companies in the virtual reality industry if they didn’t, at some point, plan to get into the virtual reality industry. It could be argued that the company plans to use the technology to add new capabilities to their tablets, smartphones and computers, but knowing Apple’s history, I simply don’t think that they have plans to stop there. While it may take a couple of years to perfect whatever technology they’re working on, I do expect to see Apple moving into the virtual reality gaming space at some point. Can Apple Dominate Virtual Reality Gaming? In my opinion, Apple can dominate anything it wants to dominate in the technology sector. The bottom line is that when we talk about Apple, we’re not just talking about the world’s largest tech company, we’re talking about the world’s largest company period! The company has a proven history of dominating any market it decides to take part in. So, there’s no reason to think that they couldn’t do the same in the world of virtual reality gaming. Does Apple have what it takes to dominate virtual reality gaming? Let us know your opinion in the comments below! Is Apple Headed Into Virtual Reality Gaming? I think Apple is really heading toward virtual reality gaming because some of their apps are. There comes a time that these would fully become as a convergence of reality gaming. I think it’s really part of their competitiveness with regard to gaming.